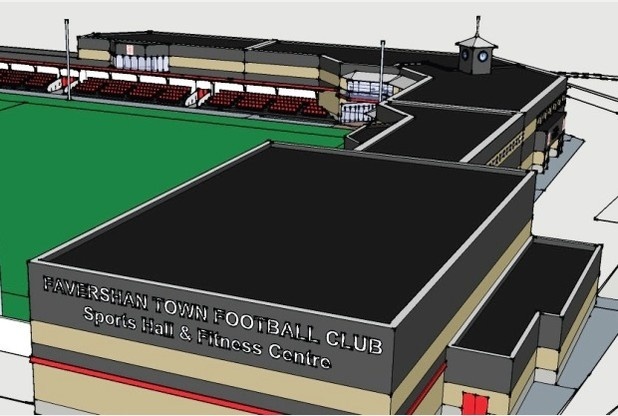 Faversham Town is currently carrying out ambitious plans to redevelop Shepherd Neame Stadium. A new changing room pavilion has been built, complete with disabled changing facilities and a medical room. The building also includes new spectator toilet facilities. The existing changing rooms and toilets will be demolished to create more space, with a second tier added above the changing rooms containing additional hospitality and function rooms to bring in revenue seven days a week. A new entrance will be installed, and the current one will become an exit. The current clubhouse will be demolished and a dedicated coffee shop built, together with a sports retail unit. New meeting rooms and offices will be built to create a versatile space bringing in extra revenue streams. A new turnstile entrance will also be added to the ground. The near-side stand will be demolished at this stage. A new 120-person stand and a fitness centre with separate changing rooms will all be installed.